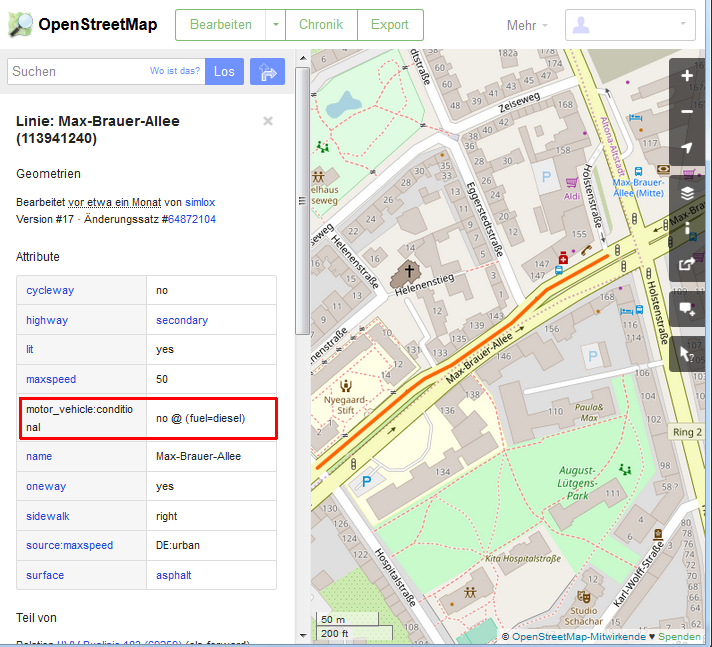 Da die Daten also schon in OpenStreeMap vorliegen, kann man nun Navis, welche auf OpenStreetMap-Karten basieren, beibringen diese Straßen auf Wunsch zu umfahren. Das beliebte OsmAnd bietet die Möglichkeit, die Routing-Profile leicht selbst anzupassen. 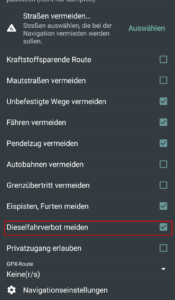 Dazu muss nur eine routing.xml Datei angepasst und auf dem Smartphone abgelegt werden. Diese Regel lässt OsmAnd für Diesel gesperrte Straßen vermeiden. Ab dem 01.01.2019 gelten nun auch großflächige Dieselfahrverbote in Stuttgart. Leider funktioniert dieser Ansatz (aktuell) nicht für Stuttgart. Er vermeidet Straßen, welche das oben genannte Attribut aufweisen. In Stuttgart sind aber nicht einzelne Straßen, sondern das gesamte Stadtgebiet (genauer: die ausgewiesene Umweltzone) gesperrt. Ich habe erst heute in OpenStreetMap die bereits vorhandene Markierung der Umweltzone mit dem obigen Attribut versehen. Bis dies in den OsmAnd-Karten landet, wird es noch bis zu einen Monat dauern (außer man hat das Karten-Abo). Da es sich bei der Stuttgarter Umweltzone aber um eine Fläche und keine Straße handelt, werden wahrscheinlich noch Anpassungen an der routing.xml nötig, damit OsmAnd die Dieselfahrverbote in Stuttgart berücksichtigen kann. Sobald es hierzu neues gibt, werde ich diesen Artikel aktualisieren. In Ubuntu 18.04, I start Clementine Music Player, but no window is coming up. But once I start Clementine another time, it comes up. No, you are not alone, it is you, me, and a bunch of other people. If you use another Debian version or Distribution, like Jessie or Ubuntu, search for the file /var/lib/apt/lists/download.mono-project.com_repo_*_InRelease and check the “Origin: ” line and adjust the origin in the config file accordingly. If this made your day or you still have problems, just drop a comment. Paypal allows you to transfer money to your friends and family. To do so, you just need the email or phone number of the recipient. I just did this and noticed something interesting: I just gave the email address of the recipient, but in the list of transactions, paypal shows the full real name of my friend as recipient, and also sent me a mail that contains the full name. This means, you can easily find out the real name assigned to some mail address that is used as a paypal account by just sending a cent to the address. Of course the recipient will notice it, but probably will not complain. This is especially interesting as paypal itself says in the footer of every email that scam mails will usually not include your real name. But scammers could first send you a cent to find out your real name and then greet you with your real name in the scam mail. It seems to be a good idea to use an email address for paypal that you use nowhere else. This way, it is not possible to find out your real name through your normal mail address. Additionally, this has the advantage that you can ignore any phishing mail that you receive in the name of paypal, but through your normal mail address and not your paypal mail address.